Welcome to peace and tranquility! Enjoy the warm, relaxing ocean available in the gulf of Mexico without the hassles of international travel. A comfortable, two bedroom home (sleeps 10) with a spacious, updated master suite including tub, & walk in closet. Features a large 2nd bedroom and full bathroom, accessible from both bedroom and open living area. The kitchen, living room, and dining area are located in the middle of the home which accommodates easy social gathering. The kitchen has custom cabinets with granite counter tops. An island in the middle of kitchen faces the open living area and deck with beach view. The house-wide half covered/half uncovered deck is comfortable for both sun worshipers and shade seekers, alike. From here, you can listen to the ocean and watch the waves. The beach is clean and quiet for family fun. Beach access is a hard surface road and is a short walk - a block and a half away. Stainless appliances include side by side refrigerator, stove, dish washer, microwave, and coffee pot. Washer and drier in master closet. Central air and heat, ceiling fans, vinyl plank and tile floors.Under cabin is concrete with gas grill and picnic table for relaxation. Walking Beach access (approx. 150 yards). Located within a few miles of the Galveston Ferry. Please Note: At end of stay, guests may wash linens and clean house for following guest or pay for pre-arranged cleaning - contact owner for rate. We really enjoyed our weekend at Peace and Tranquility. The house, the location to the beach, talking with Kathy the owner, everything was really great and recommend this place for some R&R. Very close to ocean. Beautiful home. Loved it. Amazing quaint cottage, w quality linens, bedding, and towels. The kitchen opened up into a lovely living space w views to porch and beach beyond. Will definitely return! Very nice, clean home! Nicely updated! And pet friendly! Thank you for a wonderful vacation. I was going to see if we could stay another day, but my friend had to get back home. Kathy was prompt at answering any questions. The house has EVERYTHING. The beach is an easy walk and you can see the water from the porch. There was plenty of comfy seating. If you have a baby and they need a separate sleeping place, I'm pretty sure a pack & play would fit in the master closet. Beautiful beach with easy access, surf or jetty fishing. Several good restaurants to choose from, THE BIG STORE has everything with other shops and stores all around. Golf cart and other rentals available. Live music @ local establishments. Galveston ferry just minutes away with all Galveston has to offer. 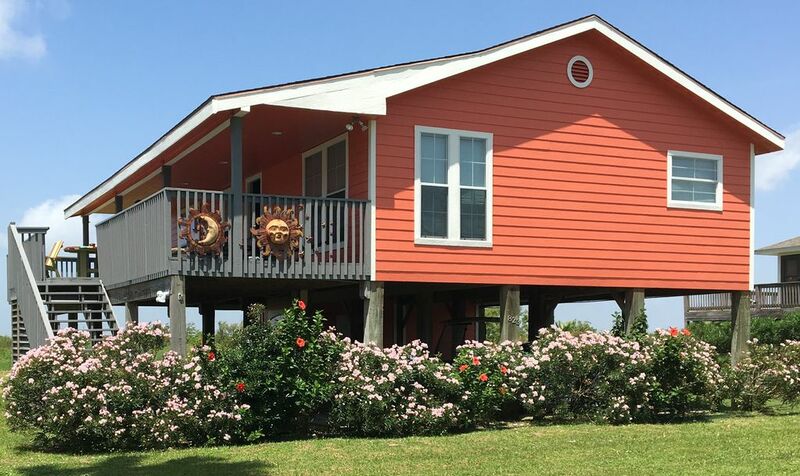 Galveston has restaurants, night life, Schlitterbahn water park, Moody Gardens, Air Museum, Train Museum, Sea Wolf Park, Fishing, Charter fishing, and anything else you can think of.